Charlotte Russe - 225 years old and still beautiful... and delicious! Could there be a greater thrill than having a dessert named in your honor? I'm still waiting for someone to create the "Mark". It would likely be a jar of Peanut Butter served with a straw. But perhaps such a gesture is banal to a princess, as may have been the case in 1800 for Princess Charlotte, daughter of King George IV, the employer of French chef Marie-Antoine Carême who created this dessert. Today a Charlotte Russe is a Cake made from delicate Ladyfingers. The Ladyfingers are often piped individually and then filled with a Bavarian Cream and held together with a ribbon. The dessert was also the showstopper challenge for Episode 7 of The Great British Bake Off. Here is my version, in seasonally appropriate Pumpkin Spice form. The filling, a Bavarian Cream (or Bavarois), is a smooth Custard made from a base of either Fruit Purée or a flavored Crème Anglaise. What makes a Bavarian Cream unique is that the base is thickened with Gelatin and then folded with Whipped Cream. Gelatin is a defining characteristic of many desserts from this era. 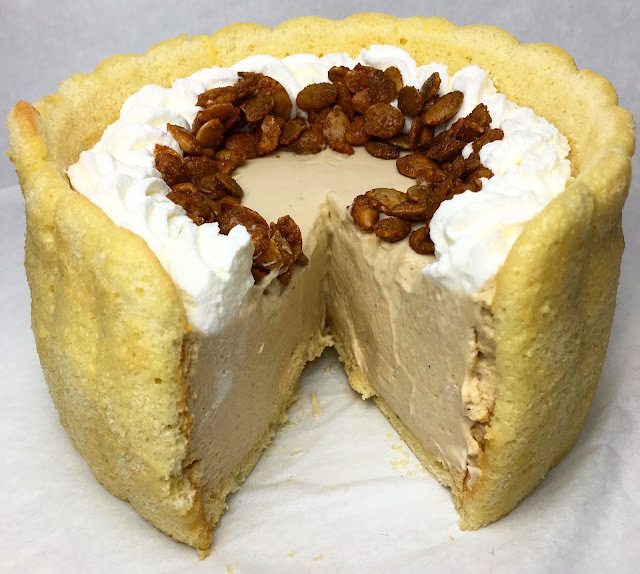 In fact, pastry lore suggests that the Charlotte Russe was an invention of necessity - a desperate attempt to save a dessert when the Gelatin failed to set in a Bavarian Cream. True or not, when executed correctly, the Bavarian Cream should be sufficiently stable on its own. The Ladyfingers Cake is just an added bonus! While not overly fancy, the components of a Charlotte Russe require some technical finesse. Ladyfingers Cake is made by delicately folding together separately whipped Egg Yolks, Egg Whites and Cake Flour. A gentle hand is required for making a light and fluffy Ladyfingers Cake Batter. Over-fold the ingredients and you will find yourself with a dense and unusable Cake. Making a Bavarian Cream is a similar exercise in the careful and precise combining of ingredients. In this case, a Fruit Purée or Crème Anglaise is thickened with Gelatin and then, at the right point as the Gelatin is setting, folded with Whipped Cream. If the two components are not of very similar consistencies when they are combined, the final Bavarian Cream will either be too loose or lumpy. The key to success in making a Charlotte Russe is good organization. Having your equipment and ingredients prepared before you being is always important, but for a dessert like a Charlotte Russe, it is essential! A well-flavored Bavarian Cream begins with a well-flavored Crème Anglaise. And a well-flavored Crème Anglaise begins with a well-flavored Cream Infusion. Thanks to the proliferation of all things Pumpkin Spice, there is no shortage of artificial Pumpkin flavored syrups (like those pumped into your Starbuck Pumpkin Spice Latté!) But this is pastry - best to keep things authentic by using real Pumpkin! To make the Pumpkin Spice Infusion, combine Milk and Cream with Pumpkin Purée and spices (e.g. Cinnamon, Nutmeg, Ginger and Clove) in a large pot and bring the mixture to a gentle simmer over medium heat, stirring frequently. Let the mixture simmer for a couple of minutes, and then immediately cool it over an ice bath with a piece of plastic wrap placed directly on the surface. It is important to quickly cool dairy products from a food safety perspective. And the plastic wrap prevents a skin from forming on the surface of the Cream. Store the Pumpkin Spice Infusion overnight in the refrigerator so that the flavors fully infuse the Cream. The Pumpkin Spice Infusion can be left to rest in the refrigerator for up to two days. The flavors will grow more intense with time. 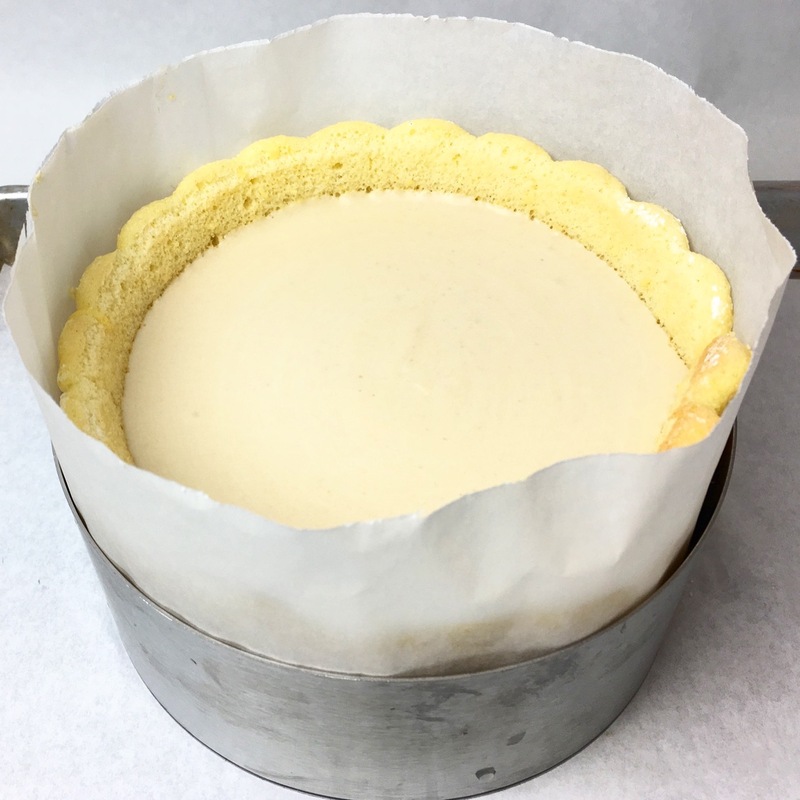 While the Pumpkin Spice Infusion builds flavor, you can make the Ladyfingers Cake, which will be used to form the vessel for the Pumpkin Spice Bavarian Cream. Ladyfingers Cake is a Sponge Cake in which Egg Yolks and Egg Whites are whipped separately and then gently folded together with Flour. There are many different ways in which the ingredients can be combined. Everyone insists that their method is best (oh, opinionated pastry chefs! ), but it's largely a case of familiarity and personal preference. One thing is critical - the ingredients must be folded together gently. Air that is whipped into the Egg Yolks and Egg Whites is key to a light Ladyfingers Cake Batter. Over-fold the Ladyfingers Cake Batter, and the final Cake will be a dense failure. In this instance, my preferred method for making the Ladyfingers Cake Batter begins by whipping Egg Yolks with Sugar until they are light and airy. 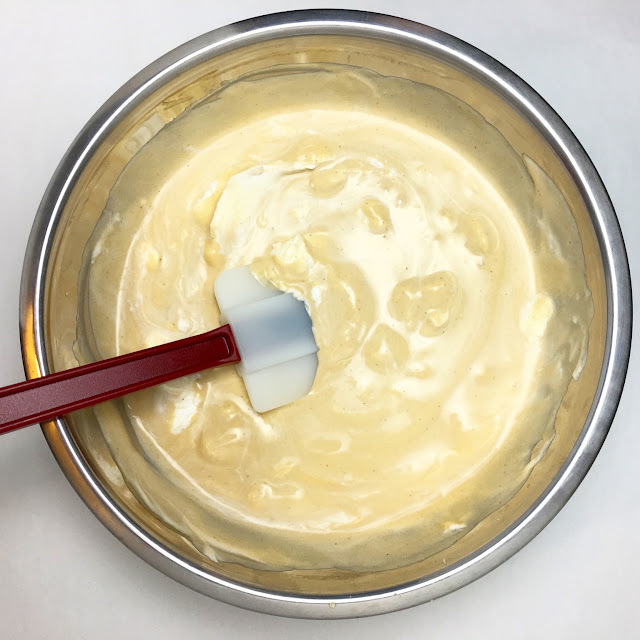 The resulting mixture should pass the "Ribbon Test" - the Batter should leave a "Ribbon" when the whisk is lifted from the bowl, and the "Ribbon" should take several seconds to sink back into the Batter. Next, gently fold the sifted dry ingredients (Cake Flour, Cornstarch and Salt) into the Egg Yolk mixture in three additions. Set this mixture aside and make a firm French Meringue with Egg Whites and Sugar. Stir 1/3 of the French Meringue into the Egg Yolk mixture to lighten the texture, and then fold the remaining French Meringue into the mixture in three additions. The final Ladyfingers Cake Batter should be piped immediately as it deflates quickly. For this Charlotte Russe, the Ladyfingers Cake Batter is piped in two ways. The first way is in a long strip of adjoining "Fingers". These "Fingers" will be used to form the walls of the Charlotte Russe. For two 6" Charlotte Russe Cakes (i.e. this recipe), the strip of Ladyfingers Cake should be 9" wide and run the entire length of a half sheet tray. Marking the parchment paper with two lines that are 9" apart makes it easier to pipe "Fingers" of consistent length. You could pipe each "Finger" individually, but piping a strip of adjoining "Fingers" ensures that there will be no gaps in the final Cake that could leak. If you pipe the full length of a half sheet tray, a single trip of the Ladyfingers Cake will be just long enough to line the inside of a 6" cake ring. However, you may want to pipe several extra "Fingers" to potentially fill in any gap, just in case you come up short. 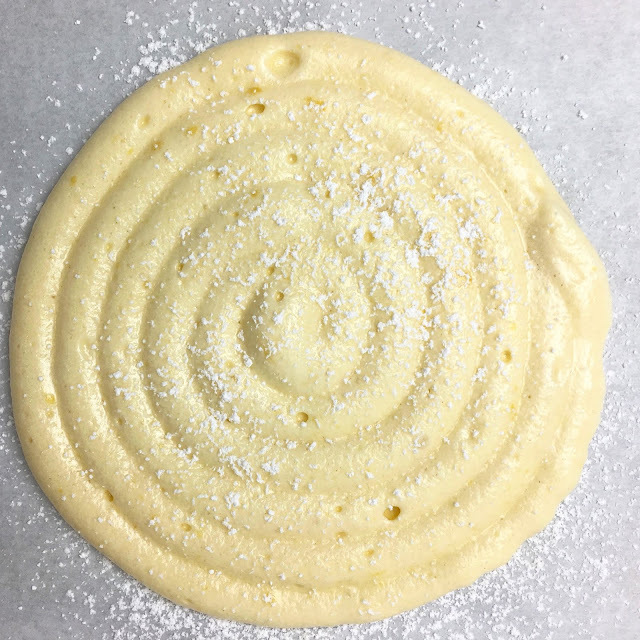 The second way in which the Ladyfingers Cake Batter is piped is in circular discs. The circular discs will be used as the base of the Charlotte Russe Cakes. Trace the inside of a 6" cake ring onto the parchment paper to create a template for piping. Bake the Ladyfingers Cake at 350 degrees Fahrenheit (177 degrees Celsius) for 7-9 minutes. The Ladyfingers Cake is done when it springs back to the touch and just begins to brown at the edges. You can sprinkle the Ladyfingers Cake with some Powdered Sugar before baking. This makes for a somewhat crunchier exterior to the Ladyfingers Cake. Once the Ladyfinger Cakes cool completely (completely! ), cut the 9" strip in half. This will leave you with two 4.5" strip to make two 6" Charlotte Russe Cakes. To form the Charlotte Russe, line a 6" cake ring with a piece of parchment. This will make it easier to unmold the Charlotte Russe once the Pumpkin Spice Bavarian Cream has set. Once the walls of the cake rings have been lined, fit one of the Ladyfingers discs at the bottom of the cake ring. You may need to trim the disc of Ladyfingers Cake if it is too large, but it should be a snug fit. Once the cake rings are lined, you can finally move on to finishing the Pumpkin Spice Bavarian Cream. Once the Pumpkin Spice Infusion is ready, strain it through a fine mesh sieve. This Infusion will be used as the base to make a Crème Anglaise. Gently heat the Pumpkin Spice Infusion with Maple Syrup in a large pot over medium heat, stirring occasionally. At the same time, whip Egg Yolks with Sugar and Vanilla Extract until they are light and airy. Once the Infusion mixture reaches a gentle simmer (approximately 140 degrees Fahrenheit / 60 degrees Celsius), temper the whipped Egg Yolks mixture by slowing streaming the warm Infusion into the Egg Yolks while actively whisking. Return the combined, tempered mixture to the pot over medium heat. While stirring constantly, gently heat the Pumpkin Spice Anglaise over medium heat unit it reaches 180 degrees Fahrenheit (82 degrees Celsius). 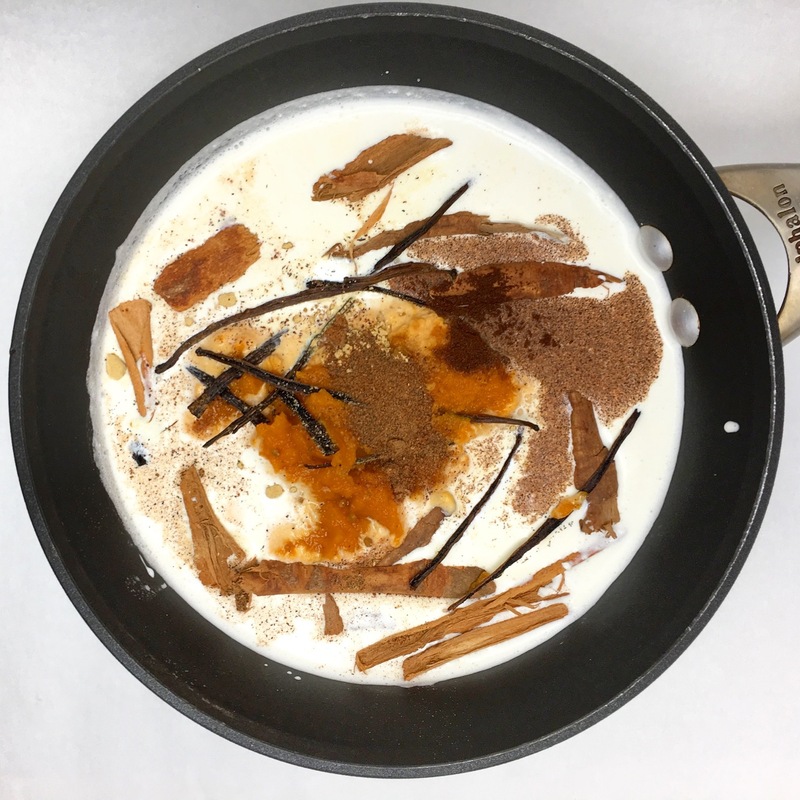 When the Pumpkin Spice Anglaise reaches temperature, immediately remove the pot from the heat and strain the mixture into an ice bath until it cools to approximately 110 degrees Fahrenheit (43 degrees Celsius), which will feel just slightly warm to touch. As the Pumpkin Spice Anglaise cools, bloom the Gelatin Sheets in ice water. When the Pumpkin Spice Anglaise reaches temperature, squeeze any excess water from the Gelatin Sheets and stir it into the Pumpkin Spice Anglaise. Gently stir the Pumpkin Spice Anglaise until the Gelatin Sheets completely dissolve, and then strain the mixture into an ice bath to cool, stirring occasionally. As the Anglaise cools, whip the Cream to medium peaks and set it aside in the refrigerator. Continue to stir the Anglaise over the ice bath until the Gelatin begins to set. Continue to cool the Anglaise until it reaches a thickness similar to the Whipped Cream. When the Anglaise reaches the proper consistency, fold the Whipped Cream into the Anglaise in three additions. Fold each subsequent addition into the Anglaise while the mixture is still streaky. Stop folding as soon as the Whipped Cream is smoothly incorporated into the Anglaise. The Anglaise and Whipped Cream must be of similar consistencies before they are folded together. If the Anglaise is too loose, it will deflate the Whipped Cream. If the Anglaise has set too much (i.e. become to thick) or the Whipped Cream is too stiff, the ingredients will not incorporate well, and the combined mixture will be lumpy. Pour the Pumpkin Spice Bavarian Cream into the Ladyfingers Cake and put the Charlotte Russe in the refrigerator to set. The Pumpkin Spice Bavarian Cream should take about an hour to fully set. Once the Charlotte Russe has set and chilled, it can be decorated and finished with Whipped Cream and Spiced Candied Pepitas (Pumpkin Seeds). 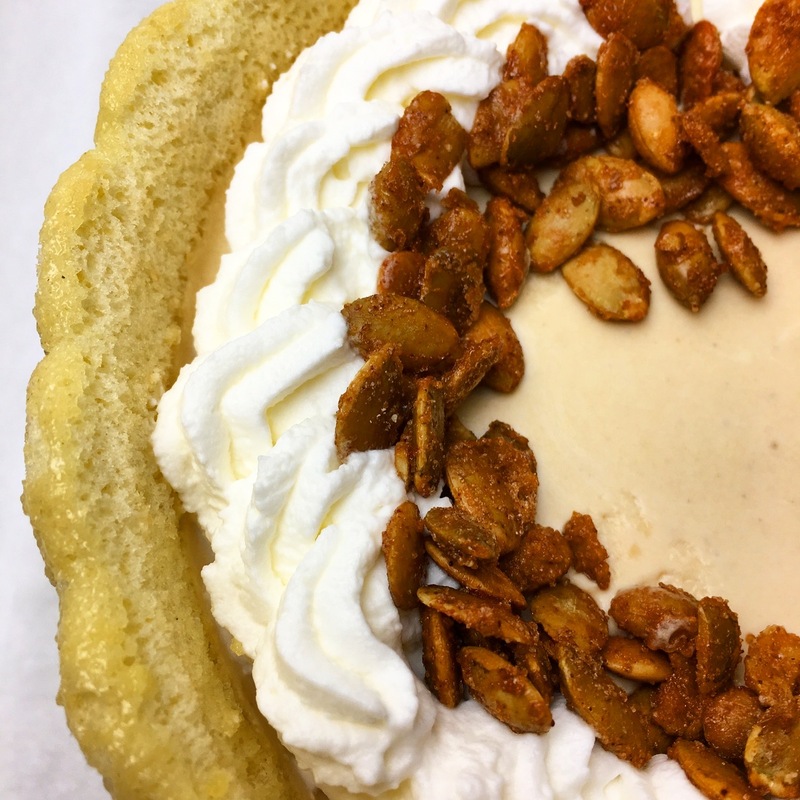 The addition of Spiced Candied Pepitas adds a lot to this dessert because the soft Ladyfingers Cake combined with the smooth Pumpkin Spice Bavarian Cream, while delicious, lacks in textural contrast. The Pepitas provide some much needed crunch. When sliced, the Pumpkin Spice Bavarian Cream should hold its form. The Charlotte Russe is best served the day it is prepared. The Charlotte Russe can be stored in an airtight container in the refrigerator for up to two days. Once the Ladyfingers Cake is filled with the Pumpkin Spice Bavarian Cream, the Charlotte Russe should not be frozen. * The final volume will vary based on how well the infusion is strained. There should be no problem yielding the 480g (2 Cups) required to make the Pumpkin Spice Anglaise. * The final yield is greater than the 480g (2 Cups) required to make the Pumpkin Spice Bavarian Cream; however, it is difficult to make Anglaise in smaller batches without potentially over-cooking or scorching the ingredients. Any extra Anglaise can be reserved as a Pumpkin Spice Sauce for the Charlotte Russe or other desserts. * While the other components for the Charlotte Russe can be prepared in advance and refrigerated, the final Pumpkin Spice Bavarian Cream must be used to fill the Charlotte Russe immediately. Separate the Eggs and allow them to temper to room temperature. Sift together the Cake Flour, Corn Starch and Salt. Line two half sheet trays with parchment paper. On one sheet tray, draw two straight lines 9" apart lengthwise down the center of the parchment. On the second sheet tray, trace two circles using a 6" cake ring. 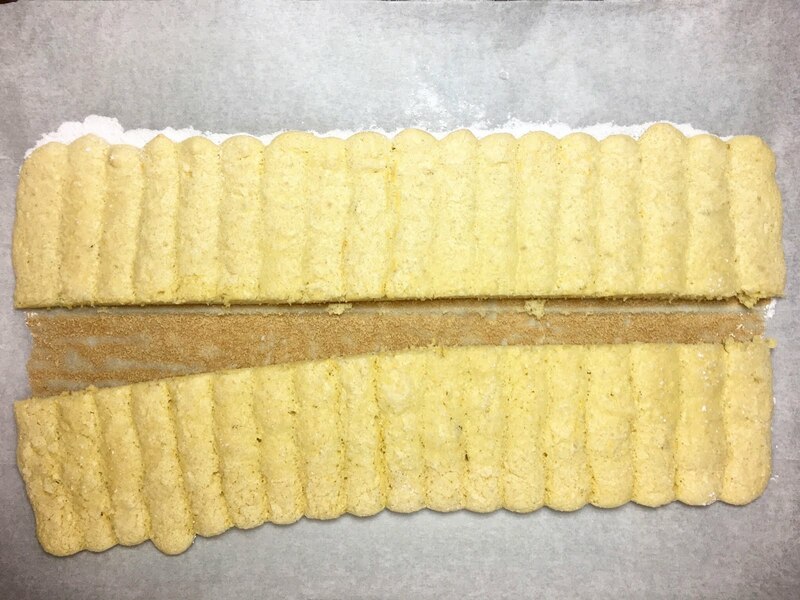 Flip both pieces of parchment so that the marked sides are facing downward to prevent the marks from coming into contact with the Ladyfingers Cake. Lightly spray the parchment paper with non-stick spray. 2. Preheat the oven to 350 degrees Fahrenheit (177 degrees Celsius). 3. In the bowl of an electric mixer fitted with a whisk attachment, whisk the Egg Yolks on medium speed until they begin to turn light and airy - approximately 2-3 minutes. Add the 65g (1/3 Cup) of Sugar. Increase the mixer speed to high and continue to whisk the Egg Yolk mixture until it reaches the ribbon stage (i.e. when the whisk is lifted from the Egg Yolk mixture, the mixture should fall slowly in a "ribbon" and briefly hold its form on the surface). 4. Remove the bowl from the mixer and fold in the Flour mixture in three additions. Fold in each subsequent addition while the mixture is still streaky. Stop folding as soon as the Flour mixture is well incorporated into the Egg Yolk mixture. Chef's Note: The Flour mixture must be well-sifted and added slowly to prevent it from forming lumps. The resulting mixture will be quite thick at this stage. 5. Prepare a French Meringue with the Egg Whites and second 65g (1/3 Cup) portion of Sugar. Place the tempered Egg Whites into a clean bowl of an electric mixer fitted with a whisk attachment. Whisk the Egg Whites on low speed until they begin to foam - approximately two minutes. Increase the mixer speed to medium and continue whisking the Egg Whites until they become opaque - approximately 2-3 minutes. Once the Egg Whites are completely opaque, add the Sugar and increase the mixer speed to high. Whip the French Meringue until it reaches firm peaks. 6. Lighten the Egg Yolk batter with 1/3 of the French Meringue by stirring the two mixtures together. Fold the remaining French Meringue into the Egg Yolk mixture in three additions, folding in each subsequent addition while the mixture is still streaky. Stop folding as soon as the French Meringue and Egg Yolk mixture are well combined into a light Ladyfingers Batter. 7. Immediately transfer the Ladyfingers Batter to a pastry bag fitted with a #3 or #4 round tip. On the sheet tray with the circle stencils, pipe two discs that will be used as the base for the Charlotte Russe. On the sheet tray with the two lines, pipe a series of 9" "Fingers" between the two lines so that each "Finger" just touches the others. On an empty space on the sheet tray, pipe several extra individual 9" "Fingers". These "Fingers" can be used in case the strip of Ladyfingers Cake is not long enough to line the sides of the cake ring when the Charlotte Russe is assembled. Chef's Note: The Ladyfingers Batter will deflate quickly, so be prepared to pipe it immediately after it is mixed. 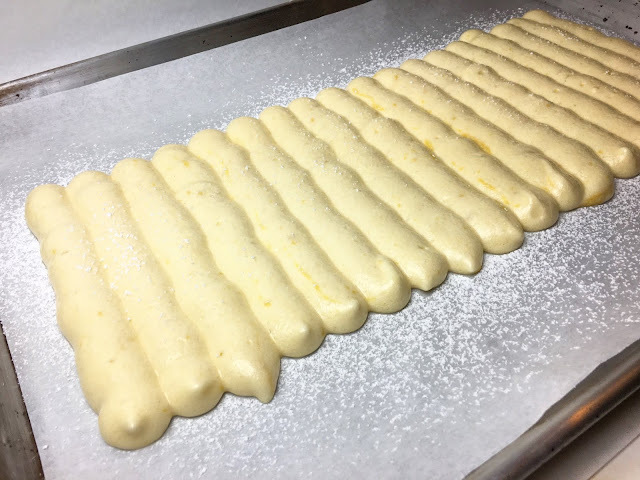 When piping the Ladyfingers Batter, hold the tip of the pastry bag about 1" from the sheet tray and allow it to fall gently. In order to make two Charlotte Russe Cakes, you will need to pipe "Fingers" down the full length of the sheet tray. 8. Lightly dust the surface of the Ladyfingers with Powdered Sugar. Bake the Ladyfingers until they spring back to the touch and just begin to brown on the edges - approximately 6-9 minutes. Allow the Ladyfingers to cool completely on the sheet tray. - The Ladyfingers Cakes are best used to make a Charlotte Russe on the day they are baked. The surface of the Ladyfingers Cakes will become sticky when they are refrigerated or frozen. - If necessary, the Ladyfingers Cakes can be prepared in advance and stored wrapped in plastic wrap for up to a week in the refrigerator or up to a month in the freezer. To prevent condensation from forming, allow the Ladyfingers Cakes to cool completely before wrapping them in plastic wrap. 1. Preheat the oven to 350 degrees Fahrenheit (177 degrees Celsius). 2. In a large mixing bowl, lightly coat the Pepitas with the Egg Whites, adding a small amount at a time until the Pepitas are just coated. You may not need all of the Egg Whites. 3. In a separate bowl, combine the Sugar, Brown Sugar, Salt, Cinnamon, Cayenne and Paprika. Sprinkle the Sugar mixture over the coated Pepitas and mix by hand. Chef's Note: The Cayenne can be excluded or reduced for those who do not like the heat. 4. Scatter the coated Pepitas in a single layer onto a parchment-lined sheet tray. 5. Bake the Pepitas until they are well toasted and crunchy - approximately 12-15 minutes. As the Pepitas bake, occasionally moved them around the sheet tray with a spatula or wooden spoon to ensure even baking. - The Pepitas will keep for several weeks when stored in an airtight container. 1. Combine all of the ingredients (i.e. Milk, Cream, Pumpkin Purée, Cinnamon, Nutmeg, Ginger and Clove) in a large pot over medium heat and stir until well combined. 2. Bring the mixture to a gentle simmer, stirring occasionally. Allow the mixture to simmer for 2-3 minutes, being careful that it never comes to a boil. Remove the pot from the heat and immediately place the Pumpkin Spice Infusion in an ice bath. 3. When the Pumpkin Spice Infusion has cooled, transfer it to an airtight container with a piece of plastic wrap placed directly on the surface (to prevent a skin from forming) and place it in the refrigerator to infuse overnight (or up to two days). 4. After the mixture has infused, strain it through a fine mesh sieve. - The Pumpkin Spice Infusion can be used immediately to make the Pumpkin Spice Anglaise or it can be stored in an airtight container in the refrigerator for up to three days. 2. As the Pumpkin Spice Infusion mixture comes to a simmer, whisk together the Egg Yolks, Sugar and Vanilla Extract until they are light and airy. 3. When the Pumpkin Spice Infusion reaches temperature, temper the Egg Yolk mixture by slowly streaming the warm Pumpkin Spice Infusion into the Egg Yolk mixture while actively whisking. Return the combined, tempered mixture to the pot. 4. While stirring constantly, gently heat the Pumpkin Spice Anglaise over medium heat unit it reaches 180 degrees Fahrenheit (82 degrees Celsius). When the Pumpkin Spice Anglaise reaches temperature, immediately remove the pot from the heat and strain the mixture into an ice bath. - The Pumpkin Spice Anglaise can be cooled and used immediately to make the Pumpkin Spice Bavarian Cream, or it can be stored in an airtight container in the refrigerator for up to three days. 1. Line two 6" cake rings with strips of parchment paper to allow for easier unfolding. Place the cake rings on parchment lined sheet trays. 2. When the Ladyfingers Cakes have fully cooled, remove them from the sheet tray. If the Ladyfingers Cakes were made in advance and refrigerated or frozen, allow the Cakes to temper to room temperature. 3. Slice the 9" wide sheet of adjoined Ladyfingers down the center to create two 4.5" strips of Ladyfingers. Line the sides of the cake molds with the strips of Ladyfingers. If necessary, trim the circular Ladyfingers Cakes so that they can fit snugly inside and at the bottom of the lined cake molds. 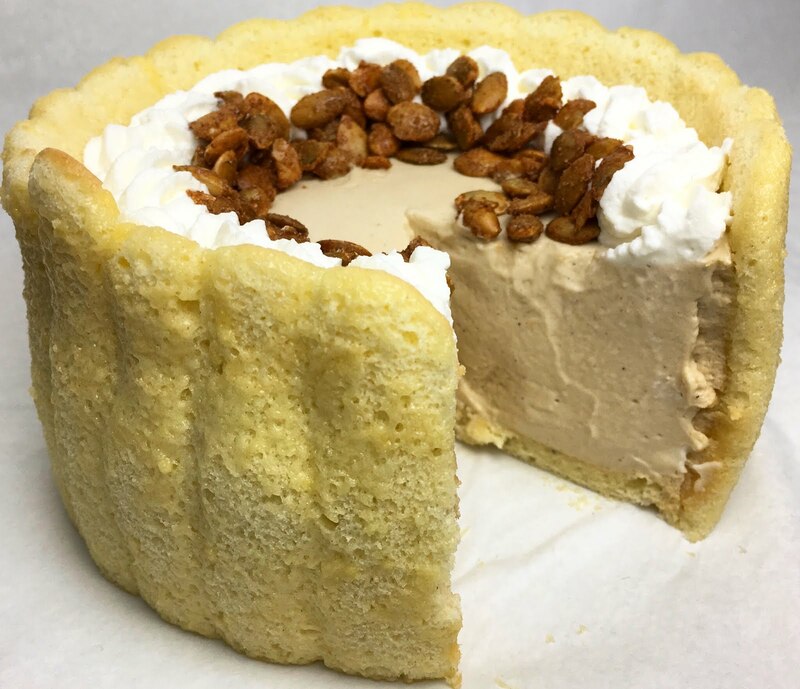 Chef's Note: The sides of the Charlotte Russe should be tightly fitted with the Ladyfingers Cake. If there is a gap, the Charlotte Russe will leak when it is filled with the Pumpkin Spice Bavarian Cream. If the strip of Ladyfingers Cake is not long enough to tightly fit, use on of the extra piped Ladyfingers to fill the gap. 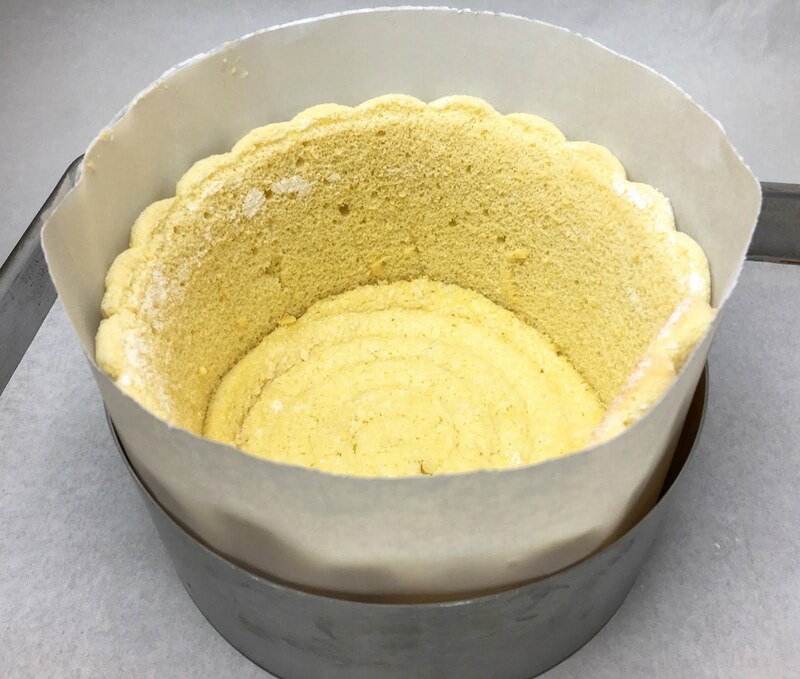 The bottom discs of Ladyfingers Cake should be fitted after the sides of the mold have been lined with the strips of Ladyfingers. 1. Bloom the Gelatin Sheets in ice water. 2. If the Pumpkin Spice Anglaise was freshly made, cool it to approximately 110 degrees Fahrenheit (43 degrees Celsius). If the Pumpkin Spice Anglaise was made in advance, heat it to 110 degrees Fahrenheit over medium-low heat while stirring. 3. When the Pumpkin Spice Anglaise reaches temperature, squeeze any excess water from the Gelatin and stir it into the Pumpkin Spice Anglaise. Gently stir the Pumpkin Spice Anglaise until the Gelatin completely dissolves and then strain the mixture into an ice bath to cool, stirring occasionally. 4. As the Anglaise cools, whip the Cream to medium peaks and set it aside in the refrigerator. 5. Continue to stir the Anglaise over the ice bath until the Gelatin begins to set. Continue to cool the Anglaise until it reaches a consistency similar to the Whipped Cream. When the Anglaise reaches the proper consistency, fold the Whipped Cream into the Anglaise in three additions. Fold each subsequent addition into the Anglaise while the mixture is still streaky. Stop folding as soon as the Whipped Cream is smoothly incorporated into the Anglaise. Chef's Note: The Anglaise and Whipped Cream should be of similar consistencies before they are folded together. If the Anglaise is too loose, it will deflate the Whipped Cream. If the Anglaise has set too much or the Whipped Cream is too stiff, the ingredients will not incorporate well, and the combined mixture will be lumpy. 6. Immediately fill the two Charlotte Russe Cakes with the Pumpkin Spice Bavarian Cream. Place the Charlotte Russe Cakes in the refrigerator until the Pumpkin Spice Bavarian Cream sets - approximately 1 hour. 7. When the Pumpkin Spice Bavarian Cream has set, remove the Charlotte Russe Cakes from the refrigerator. Decorate the Cakes with Whipped Cream and Spiced Candied Pepitas. - The Charlotte Russe is best served the day it is prepared, but can be stored in an airtight container in the refrigerator for up to two days. - The Pumpkin Spice Bavarian Cream filled Charlotte Russe should not be frozen. That's the best recipe made out of pumpkin.Pumpkin Spice Charlotte Russe is one of my favorite dish,this recipe has some twist,will check it out. This is great written, I like how people describe such things in a simple and understandable way.